My friend Matty, whose like super into the arts scene had so kindly invited me down to the art exhibition that he was involved in organizing. Besides my love in artist showcases, I was also very heartened and keen support this collaboration which aims to raise awareness and funds for this community project. Held at the Arts House, "The Paint Is The Narrative" art exhibition is a special community project by SMU students in collaboration with Dove Doodle Pte Ltd, (local social enterprise), to promote better understanding of the inherent abilities of dyslexics: their gifted-ness and creativity... and how they too, can make a significant contribution to the society. The highlight of the event, was the auction of Artist Mike Juggins' best painting, “The Union”, featuring at The Arts House. Part of the sales proceeds will be donated to Dyslexic Association of Singapore (DAS). 3 mini films were also aired to shed some light on this rather misconstrued condition. Do take some time to view the actually rather interesting video. Film 1: DYSLEXIA. - SO WHAT IS IT ALL ABOUT; A two-minute animation made in 2008 for the Dyslexia Foundation (UK). Film 3: The Paint is the Narrative; in which Mike describes his works HERE. The auction went well and the final amount raised was a whopping $2,200! The proud recipient of the masterpiece was presented with the exclusive "The Union" portrait by Mike Juggins himself and one of the partners. I stole a moment with Mike after the presentation to ask know more about this inspirations and his philosophy behind the pieces. He's such a cool guy to chat with, was answering with a refreshing frankness and dry humour. One significant area of interest is the strong influence of music in his works. 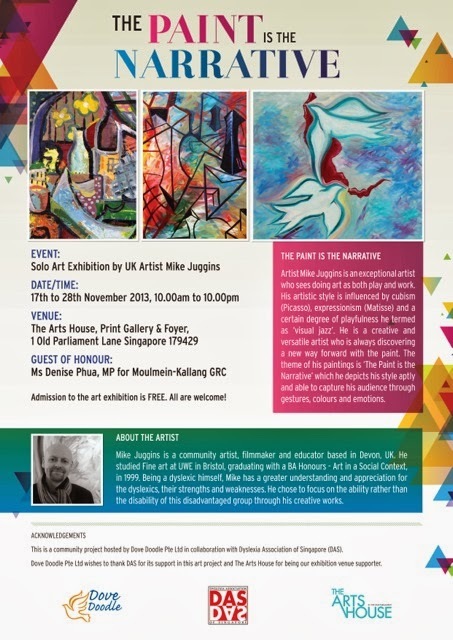 Particularly Jazz music, Mike creates his own kind of special art style called Visual Jazz. It is a concise amalgamation of his Jazz music-infused creation, constant movement of structure, a kind of metaphor. He names Talvin Singh, The James and The Waterboys, amongst a few as his muses during the creative process. responding to the music, to the colors and putting them on to the drawing board. According to him, it is his reflexive doodle, and stems from his early days in Art college. The dove, in its different stances, represents his different phrases in life and his gradual progression from initial frustration with dyslexia and the stigma surrounding it, to releasing the emotions into the canvas, and letting colors, shapes and strokes take form naturally. His pieces are very intuitive, almost organic. He utilizes feather -painting (little brush strokes) to create surreal dreamscapes of many assortments, with his signature Picasso doves and archways as a recurring theme in pieces. Take a look into the piece, and lose yourself in the frozen moment of Mike's imagery. This was my favourite piece to look at. Interesting to know, Mike is naturally left-handed but he is very natural in his right hand as well. This duo portraits quite amaze me as it nearly mirrors each other, though you would notice that the color palette used is are primary opposites. Same, yet different. Here with the ever awesome (and super stylish) friend, Matt! It was truly inspiring showcase and I walked away knowing abit more about the rather misunderstood dyslexia condition. If you are interested into knowing more about Mike Juggins and his insightful and inspiring works or wish to acquire one for your own, you can check out his website at www.mikejuggins.com (the website has some music shorts that gives you an idea of his inspiration).